Wal-Mart, Cisco, and J.M. Smucker stocks are all set for big moves over the next few trading days. 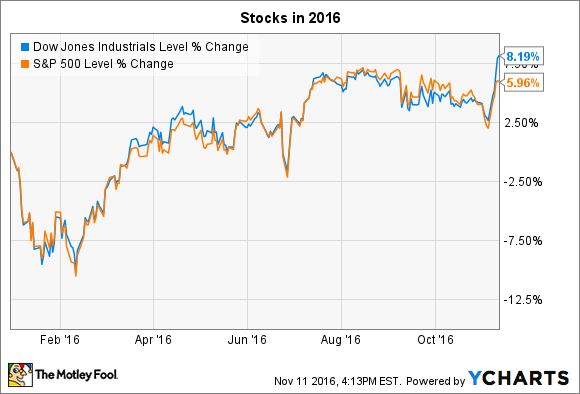 Stocks rose by a wide margin last week, despite a surprising result in the U.S. presidential election that originally sent markets plunging. By the end of the week the Dow Jones Industrial Average (DJINDICES:^DJI) had gained over 5% to reach a new record high. The S&P 500 (SNPINDEX:^GSPC) added 4% to bring its year-to-date gain to 6%. In the week ahead, Wal-Mart (NYSE:WMT), Cisco (NASDAQ:CSCO), and J.M. Smucker (NYSE:SJM) shareholders are likely to see big moves in their investments tied to fresh earnings reports. Wal-Mart posts its earnings results before the market opens on Thursday morning. The world's biggest retailer is outperforming the market so far this year on evidence that its sales growth rebound is gaining steam. At its last quarterly check-in, Wal-Mart beat management's forecast for comparable-store sales gains as it enjoyed its seventh consecutive quarter of increasing customer traffic. That improvement, plus decent results on the e-commerce side, helped sales tick slightly higher despite an almost 3-percentage-point headwind from currency changes. Consensus estimates call for similarly weak growth this quarter, with revenue rising 1% to $119 billion. Profits should decline to $0.96 per share from $0.99 per share a year ago as the company continues to invest in improving the shopping experience through initiatives like higher employee wages and cleaner store designs. Management will be happy to take that minor profit decline so long as it produces higher shopper satisfaction heading into the all-important holiday shopping season. Networking giant Cisco will announce earnings numbers after the market closes on Wednesday. And, with the stock up 15% so far this year, expectations are high heading into the report. Investors have good reasons to be bullish -- especially on profits. While sales haven't budged over the last 12 months, Cisco produced 21% higher earnings over that time as cost cuts flowed directly down to the bottom line. The company's diverse portfolio also showed its strength recently, as declines in the service provider video and NGN routing areas were completely offset by gains in other places like switching and collaboration. CEO Chuck Robbins and his team forecast that sales will tick up by 1% this quarter as non-GAAP gross margin weighs in at about 64%, or just ahead of last quarter's 63% mark. Investors can expect management to highlight the fastest-growing areas of its networking business on Wednesday in addition to its hefty cash generation. Cisco delivered nearly $9 billion to shareholders in the last fiscal year, mostly through dividends, and that figure should rise by a healthy margin in fiscal 2017 -- assuming Cisco can navigate its biggest growth challenges. J.M. Smucker, the company behind consumer food brands such as Jif peanut butter and Crisco vegetable oil, hopes to get back to its winning ways with results this week. The stock has pulled far back from the record high it reached just before its late-August earnings report revealed worrying growth trends. Smucker's big push into the pet food market has been a challenge so far, for example, as the segment suffered lower volume. Its coffee business also slowed down from its awesome growth pace thanks to falling costs that track the declines in coffee bean prices. As a result of those and other challenges, executives lowered their full-year sales growth target and now see revenue declining slightly for the 2017 fiscal year rather than holding steady. Investors will likely get an update on that projection this week. They'll also find out whether Smucker's still believes it will produce $1 billion of free cash flow and as much as $7.75 per share of adjusted earnings in fiscal 2017.